It took decades for Josiah Wise to find his voice. 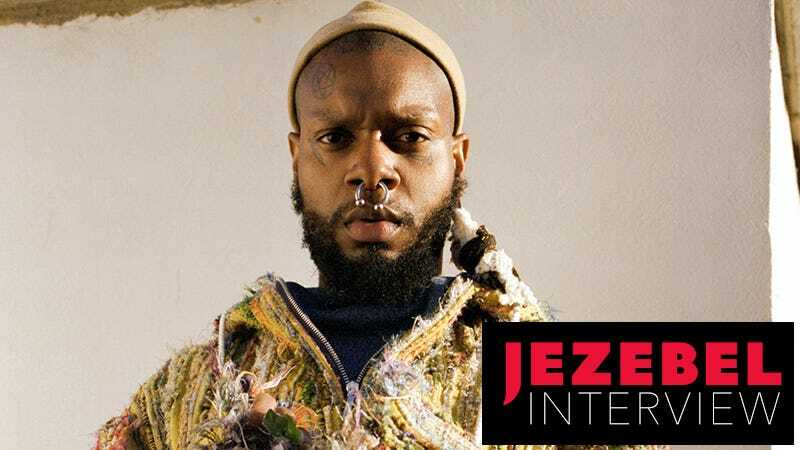 This is figuratively true for most developing adults, but for Wise, who performs music under the name serpentwithfeet, it was also literal. The distinct, shivering vibrato he sings with—so strong it sounds like his larynx is seizing almost every time he opens his mouth—was always there, even back when he joined the choir of his family’s Pentecostal church at age 6. But when he began formal training at age 11, in his mostly white, boy choir, his teacher urged him to sing in what’s called pure tone, effectively stifling his vibrato. “It’s almost like for a black person cutting off our legs,” he recalled to me last week at Gotan, a coffee spot in Midtown Manhattan. He said he struggled with it while studying music at the University of the Arts in Philadelphia—to vibrate or not vibrate, that was the question. He unleashed that voice to the world with his five-song 2016 EP, blisters. On June 8, his proper full-length debut, soil, arrives. It’s a breathtaking album, baroque and gritty, melodramatic and blunt. Some songs are specific to the point of being groundbreaking (in “waft,” a lurching ode to man funk, he sings of his stinky object of desire, “He knows love can’t exist where there is cologne”), and some are blindsiding in their tenderness. In “mourning song,” Wise makes a pageant of his grief, singing, “It’s a gift to miss you/What kind of lover would I be if I didn’t properly grieve?” The first single (and closing track) of soil isn’t lovelorn, but it’s similarly vulnerable; “bless ur heart,” in fact, is an indication of how utterly lacking in cynicism Wise’s music is—he means the titular blessing straightforwardly, not condescendingly, as it’s so often wielded in popular usage. It is a naked ode, not a tee-hee bless-his-heart eye roll. Bless your heart: he really means it. “I could have made it [less] open, but that’s violent to me,” he said. Missy Elliott was big for Wise, too. And so was Marian Anderson, Roland Hayes, Lawrence Brownlee, Juan Diego Flórez, and Cecilia Bartoli. In conversations, he has a tendency to rattle off names of the people who have inspired him—when discussing lyric writing, he strings together Gwendolyn Brooks, Yrsa Daley-Ward, Toni Morrison, and James Baldwin—as though he’s a walking tribute to those who have paved his way. Soil does rumble and stomp—often there’s little more than a stark bass-drum pulse shaping the low end, with maybe a keyboard or organ (sometimes churchy, sometimes soap-opera-esque) providing melodic support. But the vocal design can be as ornate as a cathedral’s façade. For songs like “cherubim” and “bless ur heart,” Wise recorded what he estimates were dozens of vocal tracks, altering his voice each time to sound like a contorted version of himself or a grandfather or a mouse or a duck. “I think Josiah wanted some of his songs to really feel like traffic jams at certain points to get the emotions across,” Katie Gately told me by phone. Gately co-produced six of soil’s tracks (Clams Casino, Mmph, and Adele/Rihanna collaborator Paul Epworth also contributed to songs, and Wise co-produced everything). In her own music, Gately is known for her experimental approach to manipulating her voice into complex constructions, some rhythmic, some ambient. She doesn’t have a background in R&B or gospel, per se, but she found that she didn’t really need it to be such a key collaborator on soil. That much is clear just by looking at him. When we met, he was wearing the sort of uniform he has been wearing for this album cycle—a large hoop in his septum, glitter in his beard. His many facial tattoos include a pentagram, a dagger next to his right eye, and a scythe under his left (“HEAVEN,” which is printed on his forehead was obscured that day by a bucket hat). Whatever toughness the piercing and the tattoos convey fades away as soon as you find yourself transfixed by his big, bright eyes and awash in his openness and vulnerability. He was carrying a small pompom in one of his pants pockets (he calls it his “drama pom”), but no dolls. Dolls are one of Wise’s most pronounced interests—a recent Fader profile opened in the toy section of a department store, and Wise scattered dolls on shimmering vignettes throughout the Highline Hotel’s Hoffman Hall, where he performed a show called “both moons” on May 6 as part of this year’s Red Bull Music Festival in New York. The dolls had notes attached, urging people to take them home. That night, Hoffman Hall was made to look like a church, with rows of foldout seats parted by a center aisle that Wise danced up while singing the soil opener, “whisper,” before taking the stage. Vocally, Wise was as nimble as a hummingbird, his vibrato in a frenzy, his melisma reaching up to the event space’s 40-feet-high coffered barrel vaulted ceiling above us. When he wasn’t singing outright, he would speak-sing like a preacher, adding coda after coda to his songs (“’Cause I’m church boy, I have to make every 5-minute song 40 minutes long,” he told the crowd) in front of a tree sculpture with one moon attached and one moon above. Also onstage were two mannequins who sat on a bench, named Mondawmina and Ova’East, references to parts of Wise’s hometown of Baltimore. True to Wise’s form, the two-moons concept had a lot of sources: alchemy, fairytales, symbolism of femininity, a reference to his astrology (he’s a Cancer, a moon sign), a tribute to his favorite singer, Brandy, whose “Full Moon” played just before he hit the stage (before that, Tamela Mann’s 2012 gospel smash “Take Me to the King” boomed throughout the venue). In person, Wise comes off as complicated and ornate as his vocal arrangements, as sprawling as his live show in subject matter, but I also saw a humility that struck me as natural, not at all performed. I brought up the first time I saw him live, at an Out 100 party in 2016. That night, Wise took the stage with his moody, experimental R&B songs in front of a room teeming with well-heeled white gay men. From where I was standing, toward the back, he was largely ignored. People talked over him so much that I could barely make out what he was singing into the mic. There he was, a black gay man being ignored by a legion of white gay men. The metaphors, I thought, sometimes write themselves.